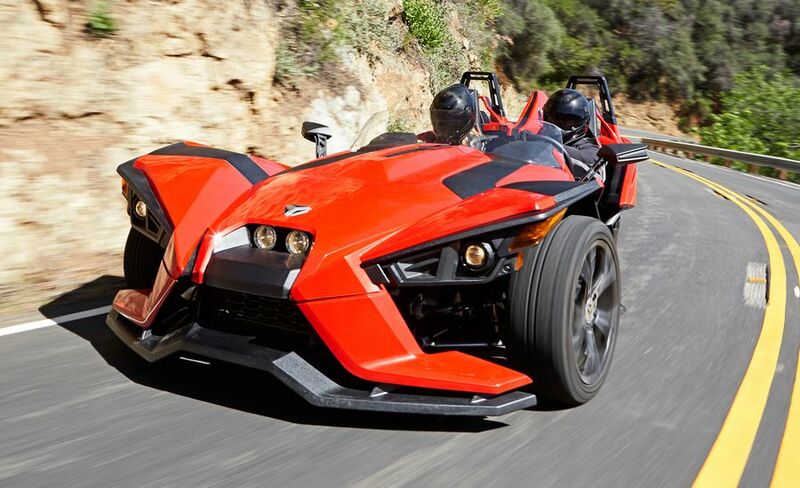 Polaris Slingshot Remains at Center of Autocycle Debate | Hupy and Abraham, S.C.
Is it a car, a motorcycle, or an autocycle? That’s a question that stirs raw emotions among motorcyclists and especially motorcyclist’s rights organizations. At the root of the problem is the configuration of this three-wheeled vehicle. Unlike what most have come to know as two or three-wheeled motorcycles, the Slingshot has a bench seat and a steering wheel. What’s the controversy all about? Well, Polaris manufactures the Slingshot, along with the traditional style motorcycle, Indian. With aging baby boomers, some of whom are challenged with balancing their beloved two-wheeled motorcycle, the Slingshot offers a great marketing opportunity to Polaris. Another niche that Polaris is exploring is the “new rider” who isn’t particularly interested in the skills and strength needed to operate a heavyweight two-wheeled motorcycle. Dealing with the laws governing motor vehicles, Polaris has been successful in getting 43 states to date to allow the Slingshot to be defined and registered as an “autocycle.” A regular driver’s license is all that is required to legally operate one, without having to obtain a motorcycle endorsement. Yet, the autocycle is within the definition of a motorcycle and must have a motorcycle license plate. Slingshot owners must abide by any state laws that govern motorcycle operation, like helmet requirements, but do not have to be tested to obtain an M endorsement since they can legally ride/drive a Slingshot with a regular driver’s license. Because autocycles are a new class of vehicle outside of the definition of motor vehicle, they do not have to meet the federal safety regulations requiring airbags, crash ratings, enclosed cabs, etc. Motorcyclist’s rights advocates argue that if there is no need for an M endorsement, autocycles should not have motorcycle plates. The concern is crash data attributed to autocycles will be included in the motorcycle crash statistics. It was also argued that there are no safety rider courses dedicated to these types of vehicles. Recently, the Motorcycle Safety Foundation has begun to offer classes known as the BRC-3-Wheel Seat and Steering Wheel class, which covers vehicles like the Slingshot. ABATE of Wisconsin has been working tirelessly to get legislation passed which would define an autocycle and require them to have a license plate other than a motorcycle plate. According to ABATE of Wisconsin Legislative Committee Chair Steve Panten, after several meetings with legislators and representatives from Polaris and Harley-Davidson, that legislation failed to move forward. Polaris wants to keep the motorcycle license plate requirement, feeling anything else would expose them to meeting federal safety standards such as those mentioned earlier, unless Wisconsin could set the safety standard requirement, which is unlikely it could legally do so. Harley-Davidson agreed with ABATE on the license plate issue and went further in considering a special dealers license should be required to sell these types of vehicles. The solution may have to come from a new federal standard and definition of what an autocycle is and what it is required to register it. To allow the various states to implement registration requirements would only add to the over-all confusion.